At 93, WullSchleger is serving this week as an International Judge at the BVI Spring Regatta & Sailing Festival. It’s an avocation he took up “as a way to stay active” when his sea legs began to fail him. Apparently, it’s working. The judges at Tortola in 2011 have a match racing event (surprise, Peter Holmberg is the early leader) and some 40 cruiser-racers to watch over in this 40th edition of the event. “We had Jim Kilroy’s Kialoa, Bill Koch’s Matador, little Russell Long with some 72-footer or other, and George Koumantaros’ Baccarat. For tenders we had my 55-foot Hatteras sportfisher and a 58-foot Hatteras. On the people side we had me, Ken Ryan from Ireland, Cy Gillette from Honolulu, Tom Ehman and Göran Petersson, who is now president of ISAF. The official count is ten challengers, but entries to America’s Cup 34 remain open until midnight, California time and there are a few mysteries still floating out there in the ether. Today I heard a figure of 14, from the chairman of ACOC. Left unclear: Does that number include Oracle Racing or not? And I repeat, ten remains the official count, if you go through channels to ask about that sort of thing. The formal process is this: At midnight or a few minutes after, the Golden Gate Yacht Club, sixth trustee of America’s Cup, will notify the Event Authority of the number and identities of its challengers. Last-minute filings may not be fully-vetted and official at that point, and I observe that it’s a lot easier to get enough seed funding to enter a challenge that it will be to get a 72-foot catamaran to the start line of a World Series event in 2012, or the Louis Vuitton Cup/AC Finals in 2013. I haven’t had time to absorb San Francisco’s People Plan, but it is suitably ambitious, aimed at leveraging lasting benefits for the city from event-driven developments. Mayor Ed Lee declared, “The challenges that AC 34 presents to the city are exactly the sort of challenges that are good for San Francisco. There are things we must do if we’re going to invite 200,000 people a day to come to the races. 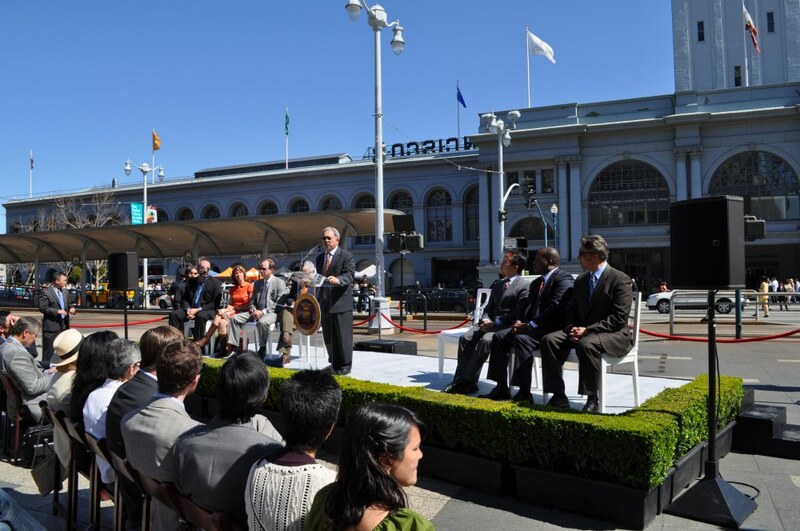 On March 31, 2011 the City delivered the People Plan to the America’s Cup Event Authority outlining the City’s plan for transporting the spectators and participants to and from the northeastern waterfront for the 2012 World Series and 2013 America’s Cup sailing regattas on San Francisco Bay. Also submitted were the Waste Management Plan, Advertising Plan, and Ambush Marketing Plans. We welcome your comments at americascup@sfgov.org or here.